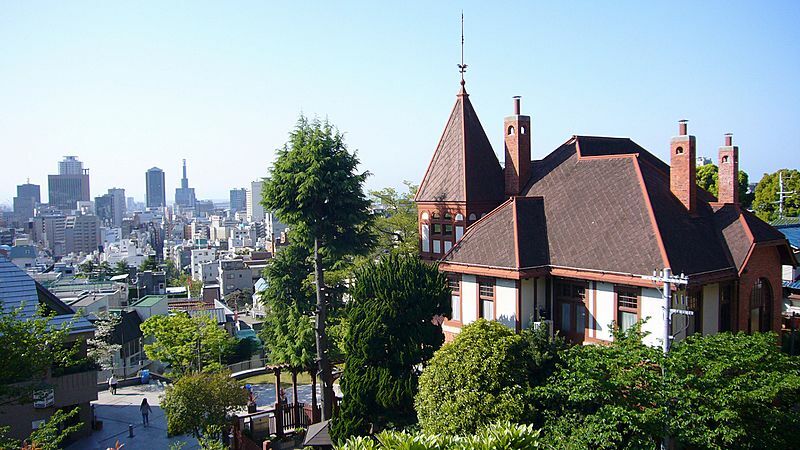 Kobe was founded in 1868 as a port for serving foreign ships. In those days most ports in Japan were closed to foreigners. Many foreigners lived in Kobe, including: westerners, Chinese, Jews, and Indiana. Kobe has one of the more important Chinatowns in Japan. People can find a synagogue and many Christian churches, too. Kobe is similar to Yokohama as a place from where modern international culture was introduced into Japan. Map of the Foreign Settlement. 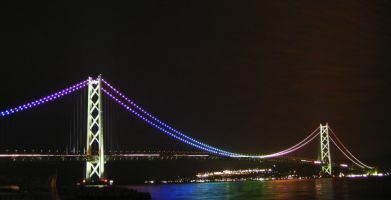 The Akashi Kaikyō Bridge extends from Kobe to Awaji Island. Kawasaki Heavy Industries headquarters on Harborland. Kawasaki Shipbuilding Co. headquarters on Kobe Harbor. Procter & Gamble Asia headquarters on Rokko Island. Nestlé Japan Ltd. headquarters on Sannomiya. UCC Ueshima Coffee Co. headquarters on Port Island. Taisan-ji. The main hall is a National Treasure of Japan. An'yō-in. Its karesansui is one of Japan's Places of Scenic Beauty. This nishiki-e (colored woodcut) shows a foreign steamboat entering Hyōgo Port shortly after its opening to the West in the late 19th century. Kobe, Hyōgo Facts for Kids. Kiddle Encyclopedia.